With Thanksgiving around the corner and our holiday bins about to be unleased, I thought an Elf post would be fitting. In fact, my husband and I have already been working on a plan of action for this holiday season – and OHHHHHH the fun that’s in store! 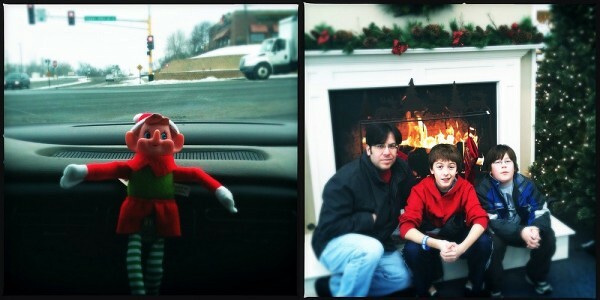 For those of you new to the Elf scene, be warned… it has a tendency to take over your life. Especially, if you have picked up a naughty elf. Let’s just say, this list of Elf ideas might be best appreciated by teenagers who should know better. 1. 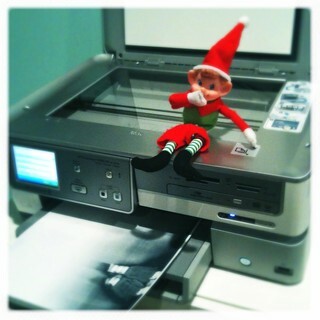 Elf photocopies his tush. We introduced this one early on so our boys would get a feel for the type of Elfcapades that were in store. They searched and searched and finally found Elf sitting on the copy machine with his shorts pulled down. In the paper tray was a black and white copy of Elf’s naked tush. 2. Elf gets a smackdown. Elf came onto the scene with a little bit of attitude and it got him into a little bit of trouble. Our boys found a tangled Elf (with a black eye) on the window ledge surrounded by snowmen decorations and tree ornaments. 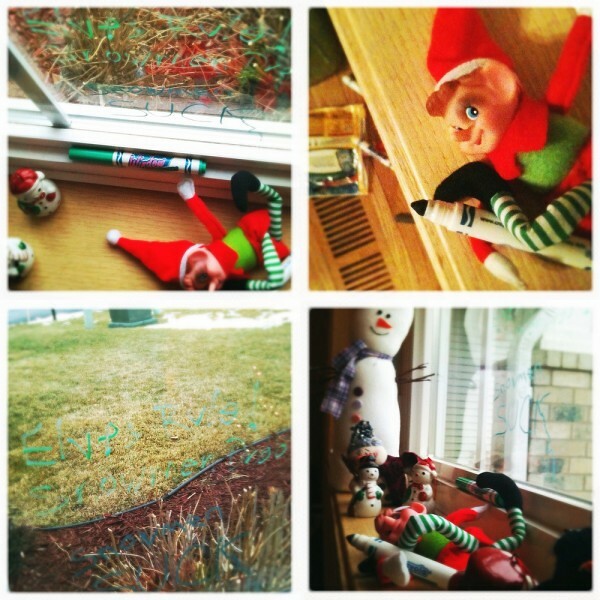 Upon closer inspection, they discovered Elf-written graffiti all over the glass (“Elves Rule, Snowmen Drool“). 3. Elf needs a sugar fix and gets trapped in the cookie bag. The boys helped themselves to a treat after dinner and discovered an extra bulky cookie bag. They opened it and discovered the above scene. 4. Elf TPs the Christmas tree. Elf’s take on decorating the tree. 5. Elf creates a zip-line. I guess things get a little boring around here in the middle of the night. 6. Elf gets trapped under a glass. Sorta like a mouse trap. But for elves. 7. Elf makes mischief in the milk. Our youngest actually had a problem drinking the green milk. After all, how exactly did Elf turn it green? 8. Elf parties until the wee hours and documents everything by photo spree. The boys found Elf with an iPhone and a giant mess of snacks. When they took a closer look, they realized he’d been on a photo spree that included SHOTS OF THEM while they were sleeping. Among other pics were: Elf and Glinda the Good Witch ornament (girlfriend?) in a bowl full of marshmallows, Elf guzzling inappropriate beverages, Elf and Glinda on a joyride in a Rescue Heroes vehicle, pictures of my husband and I sleeping (what the hey? ), and an assortment of Elf selfies. 9. Elf goes missing. All that remained was a sinister note [pictured above] that said, “If you want to see the elf again, leave two cookies in the microwave and look for further instructions!” The boys followed a series of clues that led them to a bound and gagged Elf, in our basement shower. As you can see, Tony and I have a great time together on Elf duty. It’s not always elaborate, we sprinkle lots of mellow nights into the mix and even forget to move Elf once in a while. Overall, it’s been fun activity for all of us… let’s just hope we have what it takes to make it a tradition!